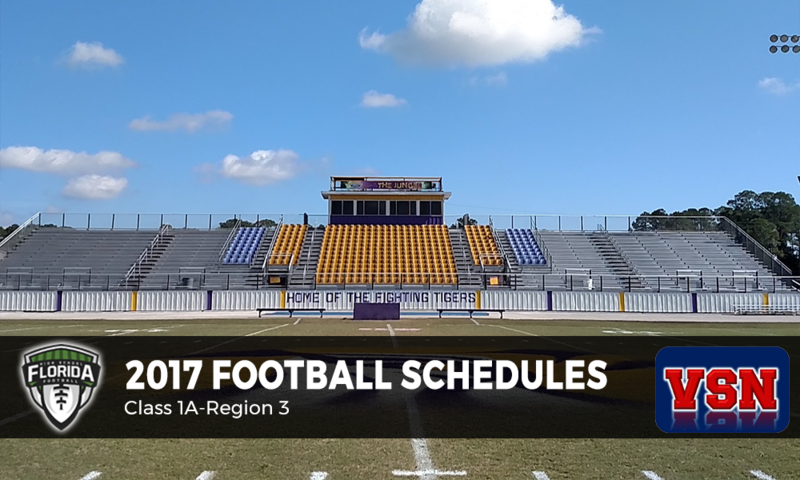 Here are the 2017 football schedules for Class 1A-Region 3, Presented by Varsity Sports Network. All kickoff times are 7:30 p.m. Eastern unless noted. • Week 3 — Fri. Sep. 8 — @ Franklin County, 7:00 p.m.
• Week 11 — Fri. Nov. 3 — @ Wildwood, 7:00 p.m.
• Week 7 — Fri. Oct. 6 — @ Franklin County, 7:00 p.m.
• Week 10 — Fri. Oct. 27 — @ Agape Christian, 7:00 p.m.
• Week 3 — Fri. Sep. 8 — @ Harvest Community, 7:00 p.m.
• Week 4 — Fri. Sep. 15 — @ West Nassau, 7:00 p.m.
• Week 6 — Fri. Sep. 29 — @ Episcopal, 7:00 p.m.
• Week 1 — Fri. Aug. 25 — @ Brookwood School, Ga.
• Week 11 — Fri. Nov. 3 — @ Rickards at Gene Cox, 7:00 p.m.